The worst thing about being banned from China, for the appalling crime of making an arts documentary there that the authorities did not approve of, is that it has left me more reliant than I want to be on the tastes and contacts of others. Unable to go and see what is developing in the Chinese art world, I keep up as best I can by viewing what is sold in the auction rooms and plodding through travelling exhibitions. The auction rooms are particularly unreliable. The difference between good Chin­ese art and the Chinese art that sells is as wide as the Gobi desert. You must have noticed that certain Chinese artists have become so collectable, their auction prices stretch into the multimillions. Personally, the sight of Yue Minjun’s ghastly grinning faces, seemingly churned out by a ­grinning-faces sausage machine, fills me with the desire to put a fist through them, they’re so annoying. Just as irritating, though at the opposite side of the grinning scale, are Zhang Xiaogang’s sombre family members from his seemingly endless Bloodline series. Here, and only here, I would happily support the reintroduction of a Chinese offspring limit. Fortunately, these horribly repetitive painters whom the Saatchi-chasers love to collect and the Chinese authorities are happy to back represent the feeble end of Chinese contemporary art. There’s another end, a vigorous, dangerous, explosive, dark and fascinating end that has never been interested in painting daubs or breaking auction records. At this end, the ­artists keep trying to invent brave new ways to tell the truth about China. The best-known practitioner is, of course, Ai Weiwei. But there are many others, and an exciting selection of them has been gathered by the Hayward Gallery in a show called Art of Change: New Directions from China. The most obvious thing about all this darkly interesting art is that none of it is painting. 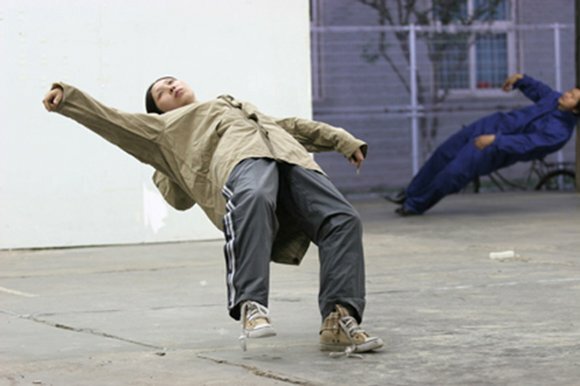 These particular Chinese artists employ other methods: performance, happenings, installations, conceptual shenanigans, time-based art. To borrow a phrase from Gu Dexin, one of the exhibitors, this is art from “the grey area”, an ambiguous creative arena located somewhere between art and life, mystery and clarity, sense and nonsense. Here’s an example: the first thing you see when you enter the show is a huge exercise machine of the sort you find in expensive gyms: this bit is for stretching, that bit for lifting weights. The artist, Xu Zhen, has modified the apparatus so it now performs its exercises by itself. Empty of humans, the slowly grinding gym equipment has become a sinister torture-robot. How can something as unhealthy-looking as this ever have found a place in the pursuit of health? The Chinese artists preferred here like to make these kinds of points in these kinds of ways about the misshapen modern society they see around them. In another gallery, Chen Zhen has covered a roomful of junky sitting-room furniture — a sofa, a telly, a vacuum cleaner — with the same golden clay from which the terracotta army was fashioned. Tellies are being compared with warriors. Now is being compared with then. Upstairs, a particularly effective video by Sun Yuan and Peng Yu records a horrible happening at which two teams of Chinese fighting dogs were placed onto jogging machines and encouraged to attack each other. The dogs run faster and faster to get at the throats of their opponents, but they can’t outrun the jogging machine, so they bark and snarl at each other with increasing craziness. It’s a brilliant encapsulation of anger and impotence. In Britain, nobody would dare to present such a performance, because of our different attitude to animals and our different animal laws. But Chinese art is as interesting as it is precisely because it has its own rules and textures, and they’re usually much darker than ours. In the centre of Sun and Peng’s gallery is a tall column of the sort Roman emperors used to erect to celebrate their victories in war. This particular column seems temptingly moist, and as yellow as the best clotted cream from Cornwall. Only when you read the label do you realise that it’s made entirely from human fat, removed by liposuction. This is a monument to modern obesity. Interestingly, grey-area art seems to have two modes. On the dark side are the transgressors and naysayers, Sun and Peng and Xu Zhen, the blunt instruments, but on the other side is a gentler group who prefer to work with much quieter atmospheres. Apparently, all of Liang Shaoji’s art is concerned with the life cycle of the silkworm. Here, he invites you into a dark room, where you put on headphones and listen to a mysterious clicking and clacking. It’s the noise of the silkworms in the hatchery next door, chatting to themselves as they spin. I was particularly taken by the quiet art of Yingmei Duan. Coming out of a small opening in the gallery wall are beautiful sounds, a lovely feminine humming, which persuades you to stoop through the opening and see what’s inside. I was lucky. I found the artist herself, in a floaty nightdress, standing in the middle of a simulated autumn forest. She smiled at me and walked towards me, slowly, her feet gently crunching the dry autumn leaves. Then she leant forward, deep into my intimacy zone, well within kissing distance, and handed me a note. I opened it carefully. It instructed me to find someone from Iraq, and to talk to them about their homeland. Naive? Yes. Buddhist? Yes. But also ever so charming and — when she lent deep into my intimacy zone — very disconcerting and physical. Bits of me were being touched in an art gallery that had never been touched before. That’s how grey-area art works: with hints and insinuations that silkworm their way into your imagination. The origins of such art lie not only in China’s long and rich performance tradition but also, I fancy, in the need to keep things from the censor. This is secretive art from a society where modernity cannot be criticised and religion does not exist. There are, of course some duds, caused most often by an excess of right-on-ness. Invited to Brazil in 1999, Chen Zhen asked favela children to make models of their homes out of wax. Unfortunately, the poignancy this wonky wax architecture may once have had has not survived. Today, the whole thing looks like a dull nursery project. The show also contains reams of fascinating archive material charting the milestones in the development of Chinese contemporary art. There’s no sign anywhere of Yue Minjun or Zhang Xiaogang.